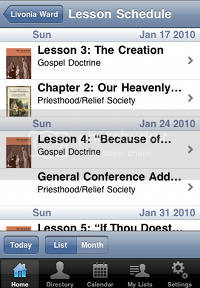 Reviewed by Matt Molen, LDSFiles.com Staff Writer My LDS Stake - iPhone App by Truestar Apps. This is a first here at LDSFiles.com - a review of an iPhone app. But I just love this one and figured you need to know about it too! 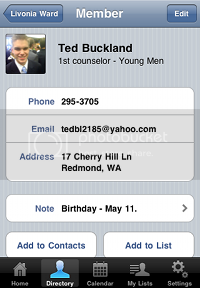 My LDS Stake is an iPhone and iPod touch app for the LDS community, makes the dream of having the name, phone number, address, and email, not to mention the church calling of every person in your stake available—all in your pocket. Now add ward and stake calendars to the mix. Oh, and the lesson schedule for Priesthood and Relief Society as well—for the entire year. The My LDS Stake website details not only features of the app, but provides a side-by-side comparison with similar but less advanced products. My LDS Stake is currently available on the Apple iPhone and iPod touch, and will be released for Blackberry devices in April. We’re all familiar with the Apple TV ads that say "there's an app for that." The same is now true for the LDS community. My LDS Stake is an elegant and thoughtfully designed app that is easy and intuitive to use. Although it's only been available since last December, thousands around the world have already discovered that My LDS Stake has become an indispensable part of their everyday Latter-day Saint lifestyle. 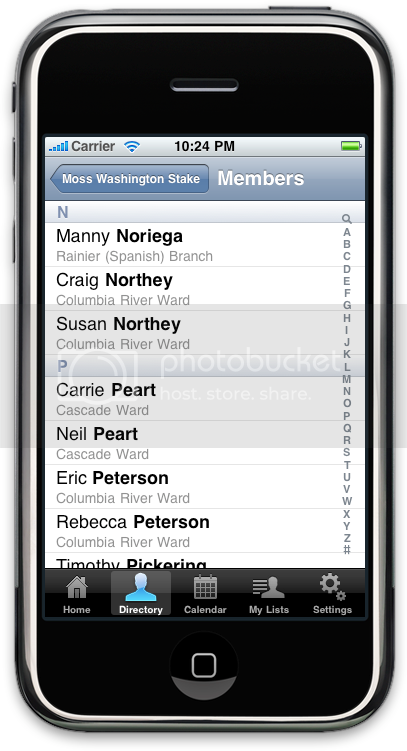 My LDS Stake , which sells on the iTunes app store for $7.99, is rich in features and allows you to personalize the member data on your device by including pictures of members, as well as editable names, numbers and email, features that other apps don't allow. You can set a passcode for an extra measure of security, and you can even have your device "phone home" if you need support. My LDS Stake conforms to Church guidelines for how member data is handled, something that cannot be said for similar products, so you can feel confident that your account and user data are being used appropriately. Truestar Apps is also the maker of the YouLearn series of educational apps, including U.S. State Flags, and Flags of Europe. Their top-notch support is available at support@truestarapps.com.